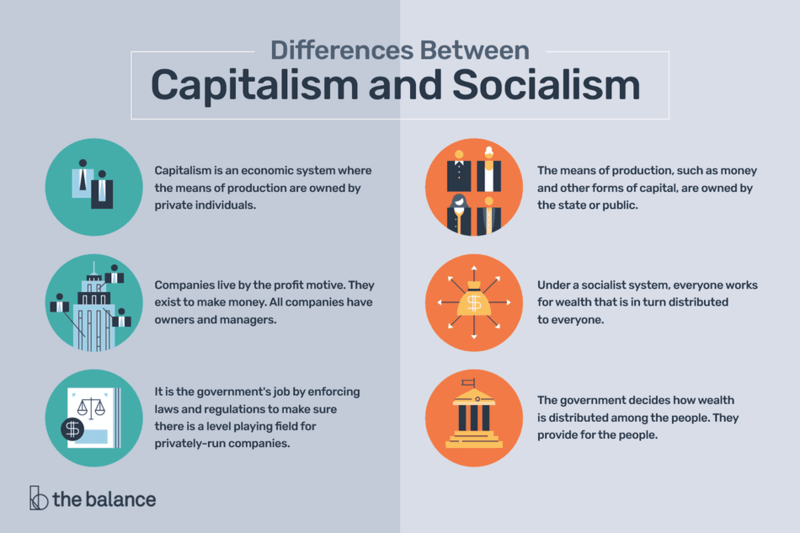 Capitalism vs. socialism. Two different political, economic and social systems in use by countries around the world. The United States, for instance, is usually considered a prime example of a capitalist country. Sweden is often considered a strong example of a socialist society. Sweden is not socialist, however, in the true sense of the word. In practice, most countries have mixed economies with economic elements of both capitalism and socialism. Capitalism is an economic system where the means of production are owned by private individuals. "Means of production" refers to resources including money and other forms of capital. Under a capitalist economy, the economy runs through individuals who own and operate private companies. Decisions over the use of resources are made by the individual or individuals who own the company. In a capitalist society, companies that incorporate are typically treated by the same laws as individuals. Corporations can sue and be sued. They can buy and sell property. They can perform many of the same actions as individuals. Under capitalism, companies live by the profit motive. They exist to make money. All companies have owners and managers. Sometimes, especially in small businesses, the owners and managers are the same people. As the business gets larger, the owners may hire managers who may or may not have any ownership stake in the firm. In this case, the managers are called the owner's agents. The job of the management is more complex than just making a profit. In a capitalist society, the goal of the corporation is maximizing shareholder wealth. Under capitalism, it is the government's job by enforcing laws and regulations to make sure there is a level playing field for privately-run companies. The amount of governing laws and regulations in a particular industry generally depends on the potential for abuse in that industry. Socialism is an economic system where the means of production, such as money and other forms of capital, are owned by the state or public. Under a socialist system, everyone works for wealth that is in turn distributed to everyone. Under capitalism, you work for your own wealth. A socialist economic system operates on the premise that what is good for one is good for all. Everyone works for their own good and for the good of everyone else. The government decides how wealth is distributed among the people. In a pure socialist economy, there is no free market like we see in a capitalist nation. The government provides for the people. The taxes are usually higher than in a capitalist system. There may be government-run health care and a complete system of government-operated education. It is a misconception that people do not pay for these services. They do pay for them through higher taxes. Socialist systems emphasize equal distribution of wealth among the people. Many countries have mixed economic systems with elements of both capitalism and socialism. In the U.S., predominantly a capitalist system, there are many government-run programs, notably Social Security, Medicaid, and Medicare. In many socialist countries, as in Sweden, there are also still private businesses.